A summary or guide of what learners should observe in the animation would be helpful to provide to students. Emphasize that the orbit of the Earth around the sun is only slightly eliptical. Highlight that on the Spring and Autumn equinox, night and day are equal no matter where on the planet one is-- 12 hours of daylight and 12 hours of night. Emphasize that the tilt of Earth does not change throughout the year as it orbits the Sun. The visual mentions that the icons for the Sun and Earth are not to scale in the animation. The visual does a good job of showing the reorientation of the star field when the point of view is changed. The motion of other inner planets and Mars is also included. Comments from expert scientist: The graphics are clear and attractive. An important feature of this video is its clear indication of when the animation is stopped and when the perspective is changed. This should help students understand the spatial relationships involved. The animation notes the orientation of Earth's axial tilt is aligned with the North Pole toward the North Star. 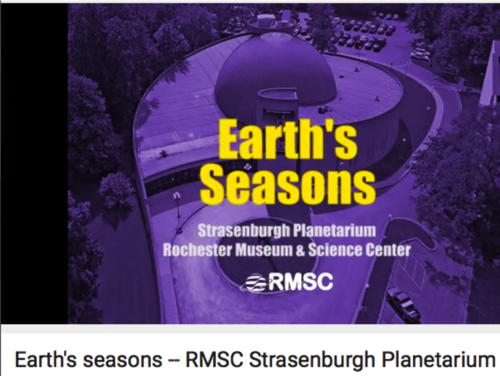 This animation is part of the Rochester Museum and Science Center - Strasenburgh Planetarium's school program "Celestial Sphere" (http://www.rmsc.org/StrasenburghPlanetarium/InfoForTeachers/Programs/Cel...). The technical quality of this animation is high and scales well for classroom projection.